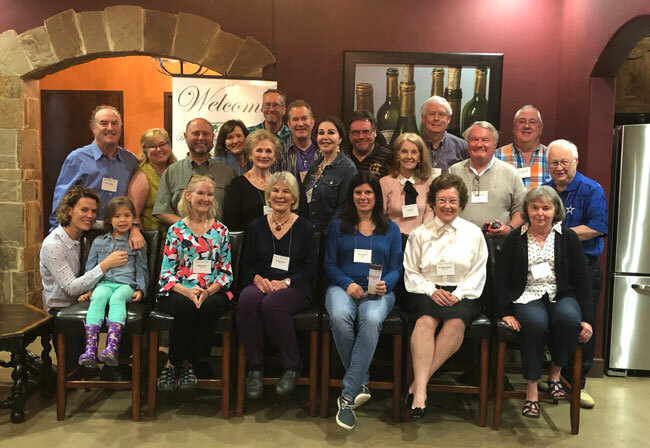 On April 13, 22 members and prospective members of the Texas & Oklahoma TCC Chapter enjoyed a luncheon meeting in the club room at Classic Wine Club in Fort Worth, where chapter member Harry Balser is a club member. Harry further enhanced the meeting by arranging for his Maine-dwelling brother-in-law Bill Yeo to present his story and video of “Bikepacking the Himalayas.” Bill and his brother Mike rode wide-tire mountain bikes, cresting passes as high as 17,000 feet. And they did this while riding singletrack on dangerously precipitous cliffside trails, and negotiating transactions such as meals and home-stays without speaking the local languages of the remote and beautiful Markha Valley. All attendees were in awe of their accomplishments. A new chapter member, Gina Morello, attended and was recognized for joining TCC as a Gold Member. As per chapter tradition, we also held a two-minutes-per-person around-the-room story-tell, of whatever travel-related nature each person wished. These included a recent trip to Yemen/Socotra (yes, it is possible! ), two Vietnam brothers who are tour guides today but fought on opposite sides of the Vietnam war, diving in Jellyfish Lake in Palau, being face-to-face with a hippo that invaded an occupied tent, a partying on-duty Air China flight crew, and several more stories. The next quarterly meeting of the Texas & Oklahoma Chapter will be held July 13 in Houston. The venue and details will be announced in due course.